Egan has wisely chosen not to compete with “Goon Squad” and its postmodern razzle-dazzle. Instead, her new book leaps into the past, offering us a story built on sturdy older forms polished to a high sheen. “Manhattan Beach” — longlisted for a National Book Award even before it was released — is a historical novel set during World War II in New York....All the harbor details — from the dangerous mechanics of underwater work to the irritating chauvinism of Navy officers — feel dutifully researched. The whole novel, in fact, boasts its tweedy historical accuracy...All these strong currents — from noir thriller to family drama to wartime ad­ven­ture — eventually return to the private moment that opens “Manhattan Beach.” If that ending is surprisingly hopeful, it’s never false, and it dares to satisfy us in a way that stories of an earlier age used to. They may also understand, rightly, that this will turn out to be a more traditional novel than the raucous and inventive “Goon Squad,” although the two books offer many of the same pleasures, including fine turns of phrase, a richly imagined environs and a restless investigation into human nature....Thus, the mystery of “Manhattan Beach” resides not in whether these three will meet again, but when. And a central satisfaction of the novel resides in how far-flung Egan’s characters will become and what varied terrain they will explore, before being inevitably drawn back together..Turning their backs on the crowded constraints of their urban lives, all three look to the ocean as a realm that while inherently dangerous also promises the potential for personal discovery and an almost mystical liberty. This is a novel that deserves to join the canon of New York stories. Unpredictably, Egan has written something that looks at first glance like a traditional historical novel. A work of remarkable cinematic scope, Manhattan Beach portrays the lives of an Irish family in Brooklyn, set against the backdrop of the Great Depression and then the second world war...Egan’s decision to withhold crucial scenes until late on ends up feeling disappointing, even if one can appreciate the reasons for her doing so...This is a novel that will pull you in and under and carry you away on its rip tides. In particular, Anna’s plight as a woman whose will is larger than her circumstances is dramatised with tremendous power. Its resonances continue to wash over the reader long after the novel ends. 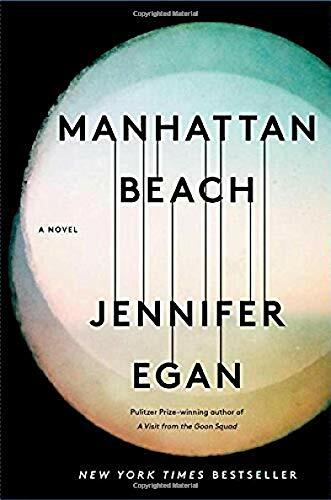 The subject matter of Pulitzer Prize-winning author Jennifer Egan's latest novel, Manhattan Beach, is not particularly revelatory. The book's overarching themes are certainly well-worn, its characters the kind we're accustomed to. The book tackles precarious familial bonds, secrets and lies, love and lust, abandonment and individualism – all ideas we've encountered in literature many times before..What is revelatory, however, is how beautifully drawn, vivid and moving this familiar setup is when crafted by Egan's skilled hand. Although the basic structure and setting is perhaps standard, her talent renders it anew – making Manhattan Beach a sparkling, lush epic of a novel....But more than any other ingredient, it's the complex dynamics that propel this human tragedy where Manhattan Beach finds its deepest strength. Even when we can predict the unravelling that is to come, it is no less enthralling. The experiences of these characters ring true, as do their flaws, their desires and their downfalls. Young Anna Kitteridge is used to tagging along with her dad, Eddie, on his business trips around New York City. It's the midst of the Great Depression, and Eddie works for the boss of the longshoreman's union on the Brooklyn docks. (The reality of his business trips is only slowly revealed to the reader, so I won't spoil it here.) One day he takes 12-year-old Anna on a visit to the Manhattan Beach home of Dexter Styles, and shortly after that he stops taking Anna with him at all. Fast-forward seven years and the United States has entered World War II, Eddie has vanished, and Anna is a 19-year-old working at the Brooklyn Naval Yard. Bored with her job inspecting machined parts for warships, she sets her sights on learning how to dive. Women have taken many jobs at the Naval Yard — even welding — since the war effort sent most working-age men overseas, but none has yet become a diver. In the midst of finding her way into this new role, Anna also has to deal with a fresh encounter with the mysterious Dexter Styles and the possibility of learning the truth about what happened to her father. In addition to the time shift, Egan shifts the narrative's viewpoint back and forth among Anna, Eddie, and Dexter. Often in novels that employ this tactic, I find myself uninterested in one or more of the perspectives and impatient to return to the compelling storyline. I felt some of that same impatience here, but not because any of the stories were uninteresting — instead, they all were very interesting and I wasn't ready to let go of one to embrace another. Not all of the characters are good, and their stories don't always end well, but I found myself wanting the best even for the worst of them. Anna leaned her head against her sister's and watched a long wave form, stretching until it achieved translucence, then somersaulting forward and collapsing into creamy suds that eked toward them over the sand, nearly touching the wheels of Lydia's chair. Then another wave gathered, reaching, stretching, a streak of silver dashing along its surface where the weak sunlight touched it. The strange, violent, beautiful sea: this was what she had wanted Lydia to see. It touched every part of the world, a glittering curtain drawn across a mystery. ... an infinite hypnotic expanse that could look like scales, wax, hammered silver, wrinkled flesh. It had structure and layers you couldn't see from land. I've always been drawn to the sea, perhaps because I spent the first eight years of my life living on Long Island, just a block from the ocean, and I thought these passages articulated my feelings about it beautifully. Another personal connection that won't be of interest to anyone but me is that both my grandfather and my father worked as longshoreman on the Brooklyn docks. The stories they used to tell, though sanitized for younger listeners, fit right in with what Egan depicts. I really enjoyed this book. Such a diversity of experiences from mobsters to sailors to divers and great story of determined young woman. The story begins in Brooklyn, during the Great Depression. We are introduced to eleven year old, Anna Kerrigan. She is particularly close with her father and joins him, on some of his “shady” outings, working for some NY gangsters. A few years later, her father mysteriously disappears, leaving a painful, hole in her life. We skip ahead a few years and WWII has started. Anna gets a job at the Brooklyn Navy Yard and here she discovers the diving trade, where divers in full gear, are sent underwater to repair ships. Women are not allowed to dive but Anna persists and becomes one of the first female divers. This is an excellent historical drama, impeccably researched, following Anna through her young adulthood, as she fights a male dominated system and also tries to investigate the disappearance of her beloved father. Egan has a gift for creating characters we want to know more of. Her pacing is excellent propelling the story forward with the reader enmeshed in the details. The locations and experiences feel fully real even if perhaps they aren't. We first meet Anna Kerrigan when she is 11 years old, when she accompanies her father Eddie on a work visit to Dexter Styles at his wealthy home near Manhattan Beach. Anna understands that this man is possibly a gangster, and she is fascinated by his home, his children, and the mystery of how her father is connected to Dexter. Years later, the country is at war, and her father has disappeared. Anna is working at the Brooklyn Navy yard, and eventually becomes the first woman diver, fixing ships below the water. She encounters Styles again at a nightclub he owns, and their lives become intertwined in unexpected ways. Only in Anna’s company could he relax and feel good about his life: “She was his secret treasure, his one pure, unspoiled source of joy.” He felt about her that she "pumped life into him as surely as Lydia drained it.” He loved her voice, the pattering quality of it, and the feel of her small hand inside his. When Lydia's doctor recommended that she have an expensive special chair to help her sit upright, Eddie needed more money, and went to work for Dexter Styles, a powerful member of local organized crime who managed a number of clubs offering the opportunity for illegal pastimes. Even at the upper levels of crime, however, there was a hierarchy. While there were many people in Dexter’s own pocket, he himself was controlled by a Mr. Q., who basically owned him. As long as Dexter played by the rules, he was rewarded. But like Eddie, Dexter constantly has to be aware of his place and modulate his behavior accordingly. Eddie unexpectedly gave Dexter a taste of escape from the limitations put on him. Unfortunately though, Eddie could not take Anna along on his forays to nightclubs and gambling dens, and they grew apart, to Eddie’s infinite regret. The story shifts, and picks up again when Anna is 19. Her father had disappeared five years before. They never knew what happened to him. She felt sorrow at first, replaced by anger. The country is now at war, and Anna works at the Brooklyn Naval Yard, where, because of the shortage of men, women are allowed to hold jobs that had always excluded them. Through perseverance and grit, she becomes the first female diver, “the most dangerous and exclusive of occupations,” helping to repair huge ships in the Manhattan harbor. One night while out with a girlfriend, she ran into Dexter Styles at one of his clubs. He didn't recognize her, so she used a false name with him, “Anna Feeney" (taking a neighbor’s last name). But she realizes he may know what happened to her father, and she continues to seek him out to get the mystery solved once and for all. Evaluation: Egan, who is the author of five books of fiction, including A Visit from the Good Squad, which won the Pulitzer Prize and National Books Critics Circle Award, takes on four big motifs with this book, any one of which could have made up a separate book: the dynamics of a family stressed by economic hardship and the birth of a disabled child; the nature of organized crime; the clash of gender and ethnicity in the 1940s; and life in the Merchant Marines, which serves as an auxiliary to the Navy during times of war. For the most part, I think the author gives adequate treatment to all of these themes except perhaps for the organized crime aspect of the book; some of what happened to the characters because of their associations with this element remained opaque (to me) at the end of the story. This is the story of Anna Kerrigan, growing up and becoming an adult during the 1920s through the 1940s. Egan’s atmospheric writing makes the reader feel part of the story. Anna challenges the stereotypes of the era, deals with tragedy, joy, friendship, loss, and the daily vagaries of life. A special thank you to NetGalley and Simon and Schuster Canada for an ARC in exchange for an honest review. Egan's latest offering takes place in America during the Depression. Twelve-year-old Anna Kerrigan accompanies her father to visit Dexter Styles, a man who she perceives to be important. Anna can't help but notice the lavish house equipped with servants, toys for the children, and the pact between Styles and her father. Years later the country is at war, Anna's father has disappeared, and she has to support her mother and disabled sister with work at the Brooklyn Navy Yard. Because of the war, women are allowed to work and perform jobs that were traditionally jobs for men. She becomes the first female diver—an incredibly dangerous occupation—repairing naval ships. Anna meets Dexter Styles at a nightclub and realizes that he is the man she visited with her father before his disappearance. Styles has ties to the mob and Anna begins to understand the complexity of her father's life. Anna Kerrigan had a special relationship with her dad, Eddie, when she was a child, but now she is grown, Eddie has abandoned her mother and disabled sister, and Anna is working in the Naval Yard along with all the other women called into service since the men are at war. The book switches between Anna's story becoming the first woman diver repairing ships and Eddie's story of involvement with the mafia (although the word "mafia" is never used). Anna is naive but brave and daring; Eddie is a charmer who is able to connect relationships, but after knowing too much "disappears." Other interesting characters include Dexter Styles, a middle level mobster with "respectable" connections through his wife's family. Brianna, is Anna's floozy aunt who eventually becomes a source of support of Anna. The story really has several plot lines intertwining and all were interesting in their own. Sometimes there is a bit too much coincidence and sometimes the author's sentences and wording are confusing to me. Jennifer Egan's novel A Visit from the Goon Squad was an excellent read, experimental in form, and winner of the Pulitzer Prize. Her recent novel, Manhattan Beach, takes on a more conventional narrative, a period piece which revolves around three characters in the years before and just after WW II. The story begins around 1934 and centers around the Kerrigan family, father Eddie, his wife, Agnes and their two daughters, Anna and Lydia. Early in the novel, Eddie Kerrigan takes his daughter Anna with him on a trip out to a luxurious beach to go see a wealthy, infamous, nightclub owner named Dexter Styles. This meeting and the three people involved will be the focus of Egan's insights into the threads of the novel. Times are hard and the ’28 Duesenberg that they drive out, which used to be theirs, now is borrowed from the local union boss. Eddie needs to make more money both in general and specifically because his youngest daughter, Lydia, born crippled and non communicative, needs a wheel chair. Though he warns Anna to behave during this important visit, she takes off her shoes to feel the freezing ocean water and Dexter takes note that she is a daring young girl. It's a scene that will reverberate as the tale unfolds. Though sections of the novel provide background and insight into both Eddie's disappearance and Dexter's fall from grace, it is Anna's story we are drawn to. She works at the navy yard and through her own determination becomes the first female diver for the US Navy. Now 19 and on her own, she runs into Dexter Styles when she visits a nightclub for the first time. She also tastes champagne for the first time: "The pale gold potion snapped and frothed in her glass. When she took a sip, it crackled down her throat—sweet but with a tinge of bitterness, like a barely perceptible pin inside a cushion." She brazenly goes up to him and begins a relationship which is as much about physical desire as it is about finding out about her father's five year disappearance. In the afterward, Egan details the research and acknowledgements, thankful for the books and people that enabled her to provide the accuracy of her time frame. Her research provided great insight into the life and times of Brooklyn when most of the men were involved overseas. Though the ending does seem to wrap up a bit too quickly and neatly, there are some interesting ironies that make it satisfying. I highly recommend this novel and look forward to exploring more of her writing, hoping that she continues to add to her already notable career. "There was a “Nurse” in the nursery, a freckled, raspy-voiced woman whose woolen dress strained like an overstacked bookshelf to repress her massive bust. Anna guessed from the broad lay of her face and the merry switch of her eyes that Nurse was Irish, and felt a danger of being seen through. She resolved to keep her distance"
I am tempted to give MANHATTAN BEACH five stars. It deserves five stars for its historical accuracy and writing style. But only it’s second half is both plot- and character-driven. The first half of MANHATTAN BEACH lays out its various characters, especially Eddie, Dexter, and Anna. But where’s the story, I wondered. Many character-driven novels neglect plot, and it looked like this book was going that way. But I continued because the writing was so much better than I had read in a long time. The second half of MANHATTAN BEACH made the wait worthwhile. Little by little the mystery surrounding Eddie is revealed. His relationship with Dexter causes the relationship between Dexter and Anna. And what a story! The plot is convoluted, and the book becomes unputdownable. So I want to give MANHATTAN BEACH five stars. But in all honesty I give it four. Centered on the Second World War, Manhattan Beach tells the story of three people; a merchant marine third mate as he works on ships sailing dangerous seas, a mob boss negotiating stormy seas of his own and a young woman who grows up in Brooklyn during the Depression and who finds her feet when she gets a job working in the Naval Yard, eventually fighting for the chance to become a diver. Their lives intersect in important ways, but their relationships with each other are almost tangential to their own stories. Manhattan Beach is a tale of two stories. On one side, there is Anna’s work life and struggles to find her role in the wartime economy. On the other side, there is Anna’s private life with her missing father and handicapped sister. Even though the two stories barely coincide, except for one key scene towards the end that sets the finale into motion, both are interesting from the glimpses into wartime New York they provide. Manhattan Beach is by no means an action-filled story. In fact, the biggest complaint about the novel from others is that it moves slowly. To me, it is a character-driven story, and the slow pacing works as Ms. Egan affords readers the opportunity to intimately understand Anna, her motivations, her passions, and her schedule. At the same time, it allows readers to learn about wartime New York and what women experienced as they went to work in roles previously held by men. We see how the gangsters transitioned from the Prohibition era to the wartime, how things changed for everyone in any role, and watch as society evolves. This historical aspect of the story is by far its strongest one. Particularly interesting was Anna’s struggles to become a deep-sea diver. History books and wartime anecdotes would have you believe that industries, particularly those involving manual labor, welcomed women with open arms to fill the voids left by the men going overseas to fight. Ms. Egan shows that this is not true. The hatred Anna faces as well as the scorn, doubt, and general prejudice she experiences just to be able to put on the diving suit is disturbing. Yet, on some levels, the misogyny surrounding her decision to dive is not surprising in the least. While it is nice to think that Rosie the Riveter, and the women who answered the call of that advertisement, faced no issues, we just have to look to today’s society to realize the likelihood of that having actually happened is nil. Anna’s story in that regard is just one more in a long line of gender bias and prejudice women continue to experience today. The second part of Anna’s story, that of her personal life, also provides historical context that educates and intrigues. As with the idealized impression of women in blue-collar manual labor roles, I never thought that the idea of a single woman living alone in the 1940s was scandalous behavior. After all, there have been women-only boarding houses in existence for decades by this point in history. In my mind, the same would seem to hold true with going out without a chaperone. However, Anna’s experiences burst this idyllic bubble of mine just as it did with Rosie the Riveter. Yet, while society may still see women as fragile and in need of protection, Anna’s story shows how the war slowly changes this attitude. Ms. Egan, through Anna, provides a clearer picture of just what it meant to be an unmarried woman during World War II. Even though the story revolves around Anna, Ms. Egan uses multiple viewpoints to round out her story. These character point-of-views fill in the gaps that Anna will never learn and help answer mysteries to which Anna will never obtain the answers. While Ms. Egan could have told the story strictly through Anna’s eyes, the multiple perspectives afford the reader the opportunity to garner the whole truth, particularly around Anna’s missing father, while allowing Anna to remain ignorant of the truth, something that feels essential to her character. In essence, they leave readers with no unanswered questions and better insight to what was occurring behind Anna’s back while remaining true to all of the characters and the story. I am ashamed to admit that this is the first book I have read by Jennifer Egan. Her other books have been on my bookshelf way too long. I have mixed feelings about "Manhattan Beach." I was a little bored at times, but I am not a historical fiction lover, so a little boredom is to be expected when I read such a book. The author obviously did a lot of research to make this book an accurate portrayal of the World World II/depression era. I think it took her seven years to write it. When the book begins, we are introduced to the heroine of the book, Anna Kerrigan. She is just twelve years old and she is obviously daddy's little girl. Anna and her father have a very close relationship and a special bond. It's apparent that Anna's father is involved in some sort of mafia/gangster activity and he begins going away a lot. Because he is gone so much and Anna is no longer allowed to join him, their relationship begins to wither. At 19, Anna's father has disappeared and she becomes the provider for her mother and handicapped sister. She tires of her factory job and pursues her desire to become a diver. It is unheard of for a woman to be a diver and Anna has to fight constantly to fulfill her dreams. Most people would have given up, but she let nothing get in her way. Around this same time, Anna also becomes involved with a dangerous man who may be able to help her figure out what happened to her father. There are many lovely characters in the story that kept me interested through the boring parts. Another thing I loved about the book is that the sea wasn’t just the setting, but it was almost a character in the novel itself. Jennifer Egan is an amazing writer and I look forward to trying some of her other books, which I understand are much different from this one. Jennifer Egan is one of my favorite authors. Most authors have a style, or an character "type", or recurring themes (think the bears and orphans and wrestling of John Irving, the men of Safran Foer whose intellect renders them unable to be happy, Hemingway's men's endless quest for distraction from self-reflection) but every Egan book is entirely different from the one before. Sure, there are some recurring motifs - absent men, mourning, childhood bonds, the non-linearity of time and human experience, but the books all feel so very different from one another. So I guess I should not have been surprised by this departure: Egan could not have written a book more different than "Visit from the Good Squad" if doing so had been her sole goal. But one thing that remains constant is that like Goon Squad and Invisible Circus, and the others this book is simply extraordinary. I was pretty darn shocked to seen that Egan had written historical fiction, a genre not known for experimentation. To be honest I was also a bit disappointed, historical fiction is not generally a favorite genre for me, especially WWII set historical fiction. I should have had more faith, I should have known that Egan would redefine the term historical fiction. I should have known that she would still play with time because it is still true that some things that happened 20 years ago are more current and relevant than things that happened yesterday, so that in storytelling events should not be ordered strictly temporally. I should have known that Egan would still use the events of the book to find what defines the humanity (or maybe the limitations of being human) in each character. I should have known that where most historical fiction is about the time, and people are placed in that time to illustrate certain things that Egan's book would be primarily about the main characters. That despite the meticulously researched and perfectly drawn time and place, this book is about Anna, in all her glory. It is about this badass feminist (before that was a word), a woman mourning her beloved father, without the closure of his documented death, a girl who wants to be what her mother wants but doesn't know what that is, a sister desperate to bring happiness to a sister locked in her own world, and a lover and friend unable to give enough of herself or ask enough from others to fully experience the joys of either role. The setting, WWII Brooklyn (my beloved-I lived in walking distance of the Navy Yards, before they were made fancy and the running suit clad made men were everywhere, and it is my spiritual home) with its war effort and its mob activity and its poverty it provides a frame for the main event that is Anna. Egan is moving to the top shelf of American Authors. This is an excellent novel of historical fiction with fully-developed characters. Very very readable. Two crucial plot points are utterly implausible, but thoroughly enjoyed this anyway.. I loved Jennifer Egan’s last book (Pulitzer Prize winner, A Visit From the Goon Squad), and although I was prepared for this to be a much different book I was still taken aback by the departure. Manhattan Beach is straight historical fiction, and Egan has clearly done an enormous amount of research to support the story. It revolves around Anna Kerrigan and her life in New York from the Great Depression through WWII. She embodies the courageous women of the period who boldly entered workspaces previously reserved for men by going to work at the Naval Yard and eventually even becoming a diver. Running parallel to Anna’s narrative is that of her father, Eddie Kerrigan and also a mid-level gangster, Dexter Styles. The three are connected and yet disconnected throughout the novel.